When I was younger, dad would drag back box after box of traditionally baked mooncakes from office. We would have 6-7 boxes stacked on our dining table ready to be savoured and distributed to the rest of the extended family. But things got boring, the difference in tastes was marginal and it seemed like such a waste to throw away those that we could not finish. So one year, we veered off the family tradition and bought only 1 box of Raffles Hotel mini snowskin mooncakes. No more traditionally baked ones, just one box of snowskin mooncakes. We have never looked back since. Our usual favourites are either the ones with champagne truffle (as you see above) or the non-alcoholic ones with crunchy dark chocolate pearls. The white chocolate truffle had a smooth creamy ganache filling heavily infused with champagne (to me at least, but I’m not very good with alcohol). The milkiness of the white chocolate went exceedingly well with delicate girly fragrance of champagne. Besides the truffle, even the snowskin and the white lotus paste seemed to have champagne to me. I was a little overwhelmed by the alcohol after 1 mooncake – well, my tolerance for alcohol is extremely low. These dainty little mooncakes can be easily finished by one person especially because the fillings are not heavy and cloying like the traditional lotus paste varieties. The paste inside is moist and blends together with the soft snowskin. It’s not a hardened chunk seperated from the snowskin/ baked shell, you get what I mean right? 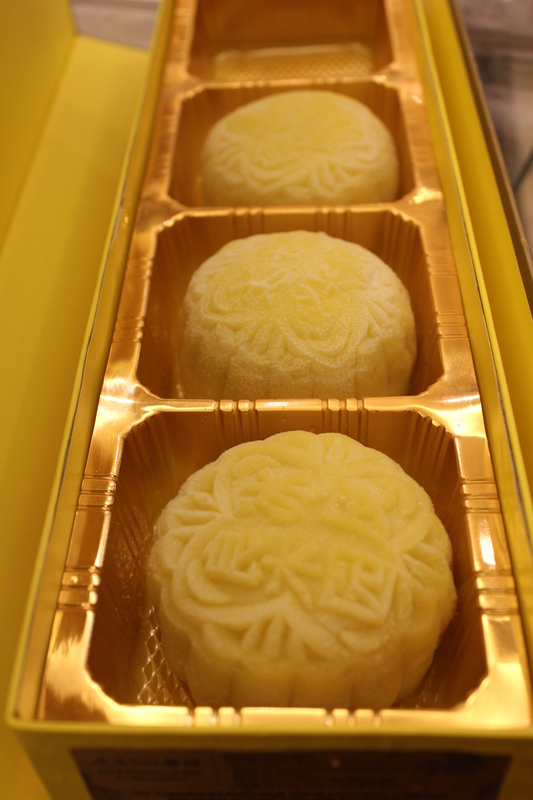 Last year we had Peony Jade’s Mao Shan Wang durian mooncake, incidentally voted as best durian mooncake by Lifestyle. 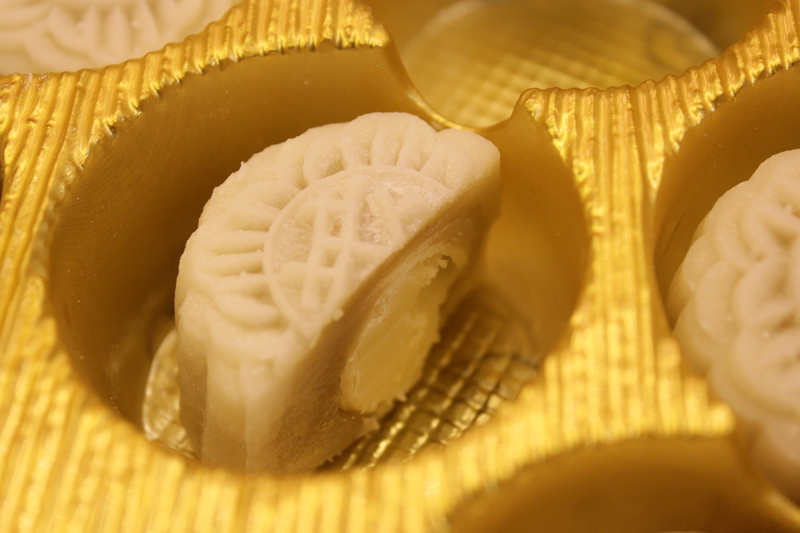 So this year for a change, we decided to try Goodwood Park’s D24 Mooncakes. Granted, you can’t possibly compare both since the flavour of the durians used are miles apart. Mao Shan Wang has a smell so potent that it fills every corner of the house while D24 comparatively has no effect at all. First taste wasn’t so impressive. The mooncake skin seemed detached from the durian pulp. 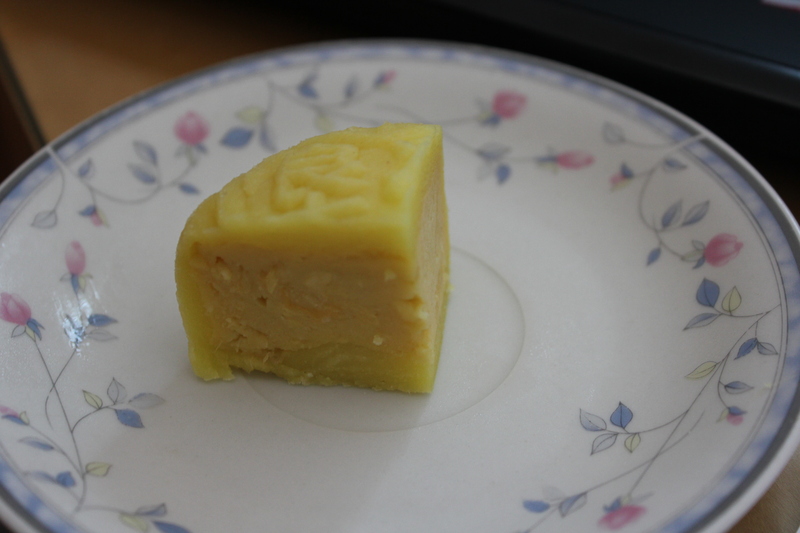 But alas, such a small piece can’t possibly give a fair judgment for the standards of a mooncake. After thawing the mooncake (you need to deep freeze it at -10 degrees!) over dinner, I slowly savoured a larger piece of it again and yes, it was not that bad afterall. Though not as potent or as bittersweet like Mao Shan Wang, the filling was D24 durian pulp no doubt, probably strained with some durian pulp stirred in thereafter. The skin while still detached was soft and delectable, certainly not a chore to finish (or even gobble) up. 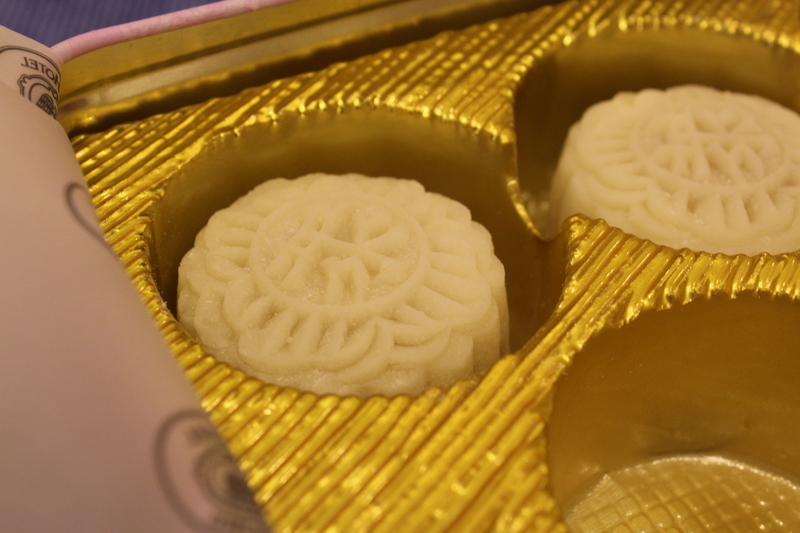 Overall a very refreshing take to the king of fruits, but I would hesitate to call it a mooncake if not for the shape! Now if only I could get my hands on the ones from fullerton…. they look awesome!